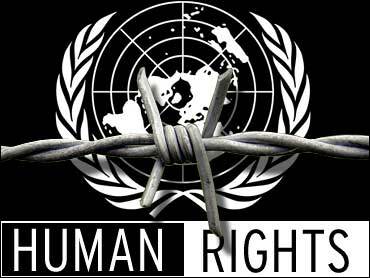 U.N. Rights Panel Slams U.S. The U.S. should immediately shut down any secret detention facilities and grant prompt access to the Red Cross to any person detained in connection with an armed conflict, a U.N. rights panel said in a report released Friday. "The committee is concerned by credible and uncontested information that the state party has seen fit to engage in the practice of detaining people secretly and in secret places for months and years on end," according to the 12-page U.N. Human Rights Committee report. The committee, which held a two-day hearing last week on U.S. compliance with the 1966 International Covenant on Civil and Political Rights, said that such practices also violated the rights of detainees' families. The United States "should only detain persons in places in which they can enjoy the full protection of the law," the report said. "It should also grant prompt access by the International Committee of the Red Cross to any person detained in connection with an armed conflict." But the United States responded that the covenant only applies in the national territory of signatories and does not apply to the U.S. military or its installations abroad, which are governed by other domestic and international laws. "Despite this clear limitation of its mandate, the committee has made at least six separate recommendations that concern U.S. activities outside the territorial United States," U.S. State Department legal counsel John B. Bellinger III said in a statement. The panel also apparently failed to take into account much of the information the United States had provided, the statement said. "We find these conclusions outside the scope of the committee's mandate an unfortunate diversion of the committee's attention," Bellinger said. The U.S. should adopt a moratorium on death sentences, noting that capital punishment appears to be disproportionately imposed on minority groups and poor people. The U.S. should increase its efforts to ensure the rights of poor people and blacks are respected in relief and reconstruction efforts, citing a concern that both were "disadvantaged" after Hurricane Katrina. The U.S. should give residents of Washington, D.C., the same voting rights as other Americans. The District of Columbia has a nonvoting delegate to Congress but no representation in the Senate. The panel said it was also concerned that the United States, for a period of time, authorized the possible use of interrogation techniques including prolonged stress positions and isolation, sensory deprivation, hooding, exposure to cold or heat and sleep and dietary adjustments. Those who used or approved such techniques, which have now been withdrawn, should be punished, the committee said. The U.S. administration should also allow detainees at Guantanamo Bay, Cuba, to seek review of their treatment or conditions of detention before a court, it added. "The state party should conduct thorough and independent investigations into the allegations that persons have been sent to third countries where they have undergone torture or cruel, inhuman or degrading treatment or punishment," the report said. The United States should also "modify its legislation and policies to ensure that no such situation will recur, and provide appropriate remedy to the victims," it added. But the panel praised this year's Supreme Court decision that trials for 10 foreign terror suspects violate U.S. military law and the Geneva Conventions, reflecting "fundamental rights guaranteed by the covenant, in any armed conflict." The statement released by the U.S. mission in Geneva noted that the panel's recent conclusions on North Korea were only about half the length of the report on the United States. "The committee loses perspective and credibility when it spends more time criticizing the United States than countries with no civil and political rights," it added. Committee Chairwoman Christine Chanet told reporters that direct comparisons between countries were not valid in the field of human rights. "We are not in the business of comparing one country to another," added Ivan Shearer, an Australian member of the panel. But he said, "We do expect something better from the United States than we expect from a developing country that has had internal turmoil. We also have to be practical in what we think a country is capable of doing." In May, the top U.N. anti-torture panel — a separate body from this committee — recommended the closure of the Guantanamo prison and criticized alleged U.S. use of secret prisons and suspected delivery of prisoners to foreign countries for questioning. The United States was taking its turn before the committee of 18 independent experts as one of the 156 countries that have signed the treaty. Criticism by the panel brings no penalties beyond international scrutiny. The experts, most of whom are law professors or jurists in their home countries, are unpaid for their service to the committee, but their expenses are covered for their meetings in Geneva and New York. The U.S. member of the panel, Ruth Wedgwood, by tradition does not participate in the examination of her own country. The panel also includes members from Europe, Latin America, Asia and Africa.